At the beginning of this year the Belarusian authorities decided to allow tourists to visit for up to five days without having to apply for a visa. This change was a huge step for a country that was traditionally quite hard to get into, and we lost no time in setting up a trip with our friends Bruno and Anita. As of this writing there are two requirements for visa-free entry: one has to enter and leave the country via Minsk National Airport (MSQ), and one has to show proof of medical coverage valid in Belarus. This can be purchased on arrival for those whose paperwork doesn't meet the (stringent) requirements; readers should be aware that the border control officer spent a good five minutes examining a copy of our policy document that we'd annotated with a highlighter. We'd intended to spend most of Sunday 2nd July visiting the two parks in the capital, but the rides were closed due to poor weather. Once it became apparent that we'd be getting no credits we made our way to the Great Patriotic War Museum, an elaborate exhibit very reminiscent of the Victorious Fatherland Liberation War Museum I visited in Pyongyang back in 2011. Later that evening, over dinner, we reworked our itinerary around the weather forecast, and though the changes cost us our planned visit to Mir Castle I'm quite confident that will still be around on our next visit to the country. Chelyuskintsev Park is an enormous public park with its own dedicated metro station (Парк Чалюскінцаў on the Moskovskaya Line). The ride area can be found a little under five hundred metres from the entrance, and right at the front of it stands Roller Coaster, a Ukrainian-built single looper that opened in 2006. Sadly we were unable to ride today as there was no train on track, but this did at least give us an opportunity to resurrect the much loved acronym "HNFT". We also noticed that the tyre drives had been wrapped in protective plastic, suggesting that there may be plans to reopen it at some point in the future. 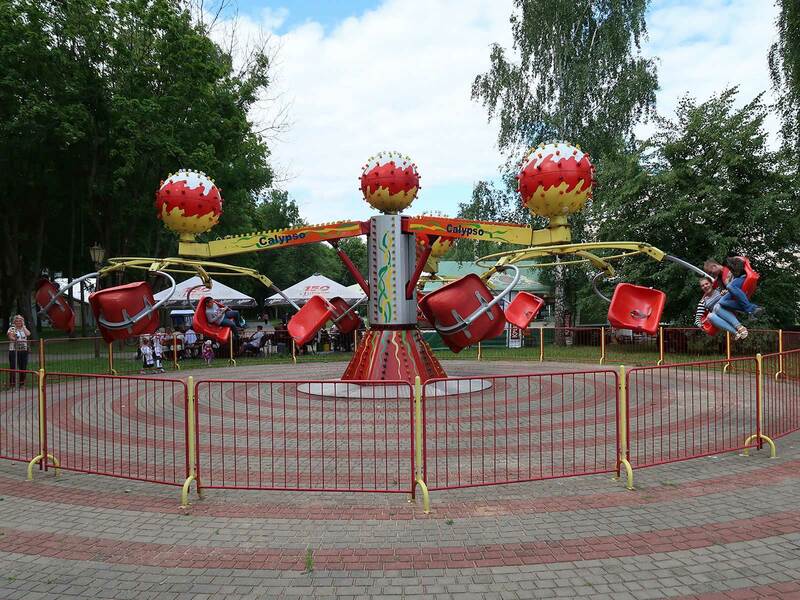 Our first Belarusian credit thus became Flitzer (#2338), a standard model figure eight spinning coaster from SBF Rides. The main kaca was not in use today; instead, the operators at each ride were selling their own tickets using portable cash registers. They made a point of giving us a receipt for our purchase despite the individual tickets costing just BYN 4.50 each (~€2). Though it was never going to be a top ten coaster I can report that the ride was above average for the genre, with minimal clunkiness and a healthy amount of spinning that generated mild dizziness as we disembarked after an interminable number of laps. The major attraction for us, and the reason for our visit to the country in the first place, was Jumbo Jet (#2339), a forty-five year old Schwarzkopf that began life at Cedar Point way back in 1972. The track was in need of paint and the sign at the top was missing, but aside from that the ride proved to be in remarkably good condition. The electric lift mechanism maintained a steady pace, and the tracking was as smooth as it would have been when it left the factory so many years ago. The second half of the course petered out a little, but that constitutes a nitpick on a ride that is older than the vast majority of coaster enthusiasts. The BYN 5.50 (~€2.50) tickets felt like an absolute bargain for an opportunity to experience a piece of history for ourselves. Readers retracing our steps should be aware that the operators require a minimum of five passengers in order to dispatch a car. We had to wait perhaps ten minutes for another group to arrive. Gorky Park is somewhat smaller than Chelyuskintsev Park, but it is no less imposing thanks to a spectacular main gate close to Плошча Перамогi metro station. The entrance is marked by a few shops, an inflatable slide, and a stone bust of Konstantin Eduardovich Tsiolkovsky, a Soviet rocket scientist. Though Anita did manage to read the cyrillic characters they were quickly forgotten as Bruno decided that they actually represented Walt Gorky, a pronouncement that caused the rest of us to lapse into fits of giggles. 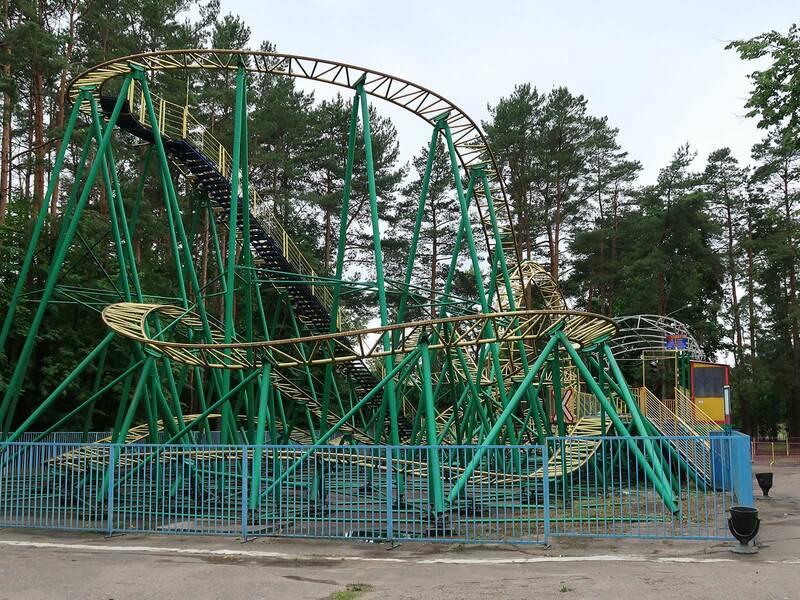 The park is home to a family sized coaster model from Pax that as of this writing can only be found in former Soviet bloc countries. We had high hopes for Wild Train (#2340) given that manufacturer's propensity towards the ridiculous, but it'd be remiss of me not to record the fact that Mild Train would have been a more appropriate moniker. The steep lift and first drop were fine, particularly in the rear of the train, but the ensuing climb used too much of the potential energy budget leaving nothing left for the rest of the layout. The final turns were thus negotiated at no more than walking pace, resulting in an experience that was scarcely more intense than a Big Apple. We rode twice mainly because it would have been rude not to with tickets costing just BYN 2.50 (~€1.15). 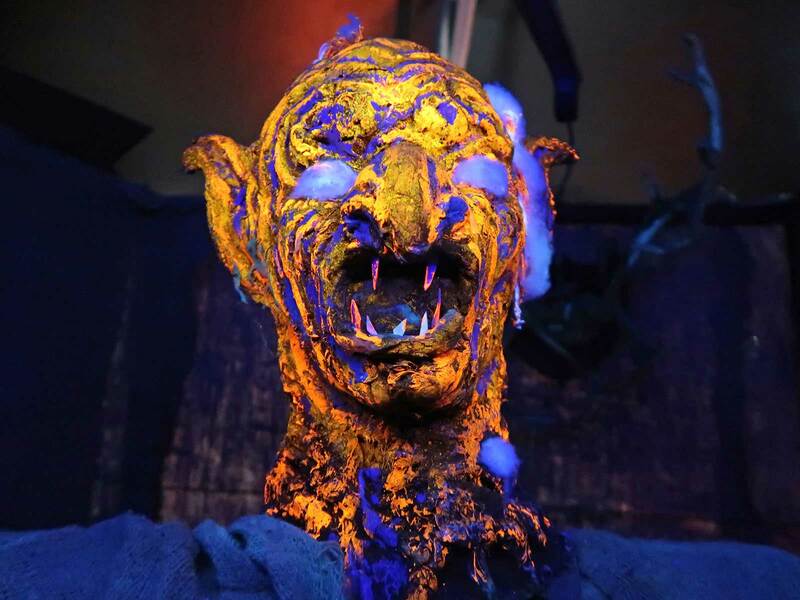 Our second stop was at a walkthrough haunted house (BYN 3.00) with a slight identity crisis. The exterior of the building, apparently assembled from shipping crates, gave it the title of Castle of Horror, but a sign just inside the door gave it the rather more prosaic Room of Fear. The experience was quite short, taking three minutes to complete only because I was photographing every scene in depth. That said, the standard of presentation was above average with plenty of detail on the models. The effects were apparently powered by lead acid batteries, as there was a large collection of them on inadvertent display just inside the entrance. The only other attraction of interest to us today was a fifty-six metre high Giant Wheel with a small number of completely open cars. The one we were assigned to wobbled alarmingly as we stepped into it, but settled quickly as the four of us pulled our over-the-shoulder restraints into place. I'd never tried a wheel of this type before, and I've got to say that it really improved the experience even if our photographs were essentially limited to one direction (which in the case of Gorky Park was trees and not much else). It would be great to see these cars retrofitted to wheels elsewhere in the world. We thought about making a brief stop for lunch after our first two parks, but a quick glance at the queue in the local branch of McDonald's was enough for us to abort. The drive distance to Suvorov Park was predicted to be around three hours, and we didn't want to go all that way only to arrive at closing time. (It was only on arrival that we discovered that the park generally sells tickets until 8:45pm, a data point that may be useful to other enthusiasts retracing our steps in the future). Virtually all of the journey was on the M1, a well-maintained and not particularly busy motorway with a speed limit of 120 kilometers per hour. This was rigorously enforced with safety cameras at regular intervals, and given that, it wasn't much of a surprise to find that local drivers were content to stay well below the maximum. Our rental car had no cruise control or speed limiter, making the journey somewhat tedious for Bruno as designated driver, but he completed the drive without incident or complaint, pulling into a parking space about two hundred metres from the park entrance at around half past four. It was quickly apparent that we'd arrived on a busy day. There was a musical performance underway in an open air auditorium next to the entrance, and plenty of people in the main park area. The rides that we could see were for the most part targeted at young children, with only a handful for older guests. Wasting no time we purchased four BYN 1.25 (~€0.65) tickets for Mini Mouse (#2341), a standard Zamperla model and my tenth encounter with the genre. This version had Holidog on the lead car instead of the more common locomotive, but the experience otherwise was pure vanilla. We were given four laps, which was three more than we needed. Given how far we'd driven we decided it was worth investing BYN 1.65 (~€0.75) apiece to ride the Calypso, broadly speaking an inverted three arm Polyp and an apparent staple of parks in eastern Europe. The machine had some very tight clearances, to the point that I decided to cross my legs so as to avoid kicking the centre column. The programme today was forceful enough to be thrilling, and I'd likely have enjoyed it far more had I not been riding on an empty stomach.